In consideration of Pope Francis’ electrifying visits to Cuba and the United States, and with millions of Americans still savoring his message of peace, forgiveness, inclusiveness, and human dignity, it might be instructive, perhaps even inspirational, to consider an earlier pontiff whose forthrightness and simplicity during a time of turmoil transcended a brief reign. 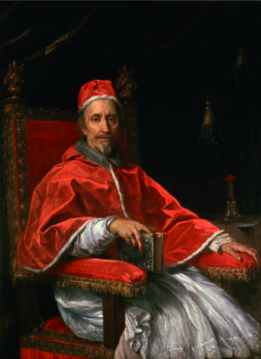 Pope Clement IX, born Giulio Rospigliosi in 1600 to a Tuscan noble family, would serve the Church during a century that, along with the fourteenth and twentieth, would count among the bloodiest in history. Favored by Urban VIII, a scholar, for his gentleness and erudition, Rospigliosi was made Archbishop of Tarsus, but was forced into retirement by the succeeding pope. In 1655 he was recalled by Alexander VII, who elevated him to the cardinalate. With Alexander’s death in 1667 he was elected unanimously to the papacy. For beatifying Rose of Lima in 1667, who would become the first saint born in the Americas. For instance, it was Clement who established the first public opera house in Rome, in 1668. And during his reign Bernini completed the embracing colonnade in St. Peter’s Square. Noteworthy also is that during the high-water mark of the Italian Baroque, the pope refused to place his name on any building, fountain, or public sculpture. And it was only when sick that he agreed to sit for Maratta, for a beautiful portrait known for its color, conveyance of personality, and classical restraint. Clement died in December, 1669. He had been pope for two-and-a-half years. He stated that he wished to be buried under the floor of Santa Maria Maggiore, with a simple inscription: Clement IX, Ashes. (This was too much for his successor, Clement X, who erected the magnificent tomb in the Basilica’s nave.) Indeed, the words of Pope Francis could apply to Clement: Everybody, according to his or her particular abilities, should be able to make a personal contribution to putting an end to so many social injustices.